Now, if you spend even the briefest amount of time anywhere in London, you'll be aware of the multitude of food pop-ups that have been taking the city by storm. 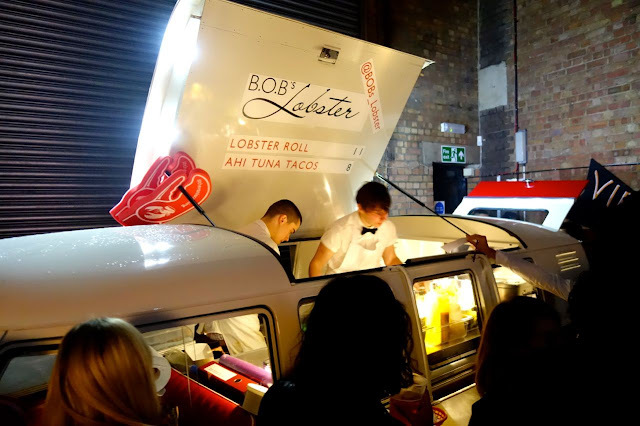 With a whole host of stalls, winnebagos, trailers, shacks, take-overs, you're spoilt for choice whether you're in Soho or Streatham, in a car park or in Covent Garden. 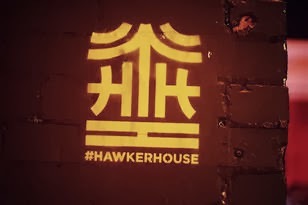 Following on from summer successes, Hawker House Street Feast has been holding residency on my doorstep, in a warehouse just off Broadway Market. Running every weekend until Christmas, and open from 5pm til 2am (how good is that?! ), I finally made it down last Friday. It's free before 7pm and after 12pm, with a £3 entry fee in between - but judging by the amount of people buzzing in and out, it's definitely worth the hype. All dark and decadent with a red-light feel, there's a whole host of the city's finest food trucks to choose from - I spied Breddo's Tacos and Rola Wala as soon as I walked in. I found my pals amongst the food frenzy at Yum Bun - the incredibly popular steamed bun guys. Pillow-soft steamed buns are filled with your choice of the freshest ingredients. I went for the Pork Bun (£4, or £7 for two) - slow-roasted pork belly with cucumbers, hoi sin and spring onions - and it was to die for. The perfect combination of flavours with the right amount of crunch - I've been craving it ever since and I'm left wondering when I'm next going to get my fix. If you're feeling a little peckish, get two as these perfect little pockets disappear quickly and you'll be too impatient to queue again! Whilst my friends got the biggest pile of the stickiest ribs from Smokestak (ribs are my idea of food hell, what's with that? ), I couldn't get over fast enough to Bob's Lobster - the cutest little split screen VW where the chefs are all decked out in shirts and bow ties. I dove straight in to the lobster mac and cheese (I'm going through a bit of a mac and cheese thing at the moment) and fell head over heels in love. At £8 a pot, it's not your quick smash-and-grab but worth lingering over as the creamy cheese brings out that gorgeous silky smooth taste of the lobster meat. Topped with fresh spring onions for that little bit of bite, this is a dish that's gone straight to the top of my list. As a result of my poor financial planning (I only had £20 cash on me) I didn't make it to any of the other stalls. This was devastating, as watching unattainable slider after slider be consumed by the people around me broke my heart. Having said that, there's a few more weekends left until Christmas and so plenty more opportunity to go again. Next time, I'm taking enough cash to consume something from every single stall...I mean, it's got to be done, right?